Is there any way this could possibly have worked? It seems like way too subtle a problem to solve just by matching certain frequencies. I’m sure you could program a computer to do a pretty good job of this now, but even that would have problems. And even if it worked, who’s to say a commercial can’t have music? RADIO listeners who dislike advertising announcements and long speeches will welcome a new invention that automatically shuts off voice programs. The device, known as the “radio advertising eliminator,” will operate the radio only when musical programs are coming over the air. Just as soon as any voice announcement is made from the station, the radio receiver is turned off and is not turned on again until the musical program resumes. 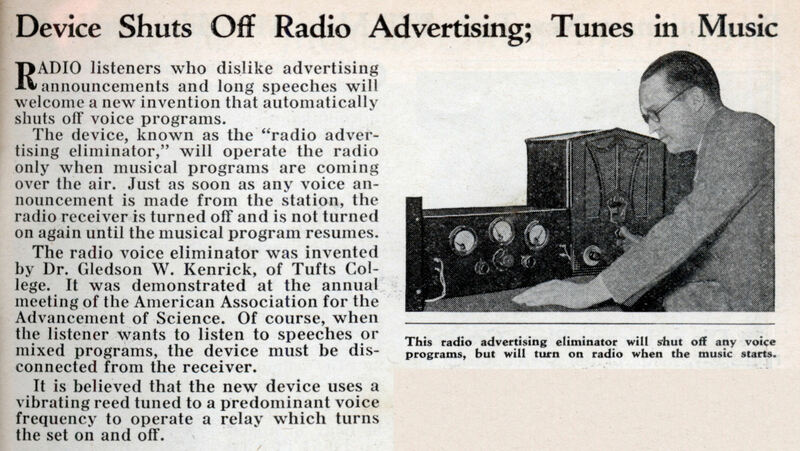 The radio voice eliminator was invented by Dr. Gledson W. Kenrick, of Tufts College. It was demonstrated at the annual meeting of the American Association for the Advancement of Science. Of course, when the listener wants to listen to speeches or mixed programs, the device must be disconnected from the receiver. It is believed that the new device uses a vibrating reed tuned to a predominant voice frequency to operate a relay which turns the set on and off. Actually, It’s more or less doable. More than going after a certain frequency I’d be more inclined to believe it went after a certain average amplitude in the incoming signal – commercials would be “louder” than the typical programming, so it would sense that and off it went. I don’t mind manually hitting the mute button, but an automatic device to kick the radio or TV OUT of mute at the end of the commercials would be nice. If wonder if Dr. Kenrick was sued into oblivion in the same way media lawyers went after ReplayTV for their “commercial advance” feature. Radio “Commercial Killer” circuit schemes have been around almost since radio commercials. Most work by detecting the audio clipping in the signal. When the Audio signal ‘clips’ (exceeds the max amplitude of the circuit) the killer circuit shuts off the output. Generally there is like a three second delay before it can come back on. Do radio stations still use tones to signal network and local breaks? 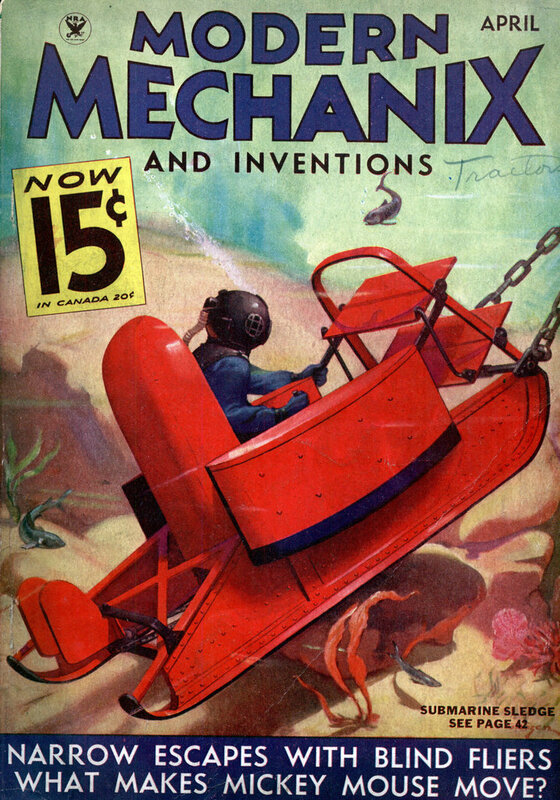 Did they use them to automate at the time this article was written?